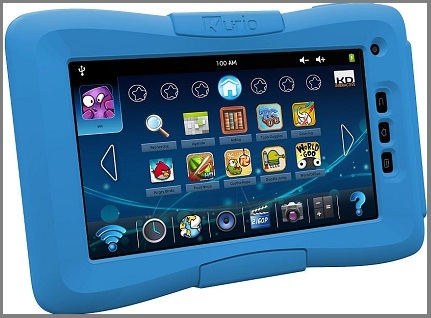 Kurio is the tablet designed for children, which means that this 7″ tablet comes with associated shock protection in different pastel colors, has a severely modified version of Android on the inside and allows you to customize exactly how much access the children should have the internet and web pages. By creating user profiles, you can let different children have different levels of access to the internet and apps. Kurio comes preloaded with popular Android game such as Angry Birds, Doodle Jump, Where’s My Water, Cut the Rope and World of Goo. To purchase new apps require that parents approve it, so you do not have to worry about surprising appstore bills. Kurio is no technical monster, if you look under the hood. Here is a dual core processor at 1.2 GHz, seven-inch screen has a resolution of 800 x 480 pixels, storage capacity of 4 GB and cameras have 0.3 and 2.1 megapixel resolution. You have the possibility to use the sd card for storage and Kurio can be connected to your TV via Micro-hdmi. And Android 4.0.3 is also a plus. But its still pretty good, especially since a 10 year old might not need the latest 64gb ipad with 3g capability. 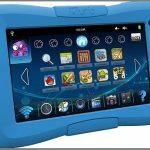 For 199$, it is also one of the cheapest surf tablets on the market, so you do not start to sweat every time your five year old starts to swing with it. it looks good and its cheap i must try it!